My 5000 K XHP 50.2 came in today .Totally messed up the swap. I should of taken the new emitter off the new 20mm board and put it on the 26mm board that comes stock in the SP33. Instead I installed the 20mm board thinking there was clearance between the soldier joints and the reflector. Well there is if you keep the soldier blob real low but mine shorted . That in itself would not have put the kabash on things but when I removed the lens , the gasket stuck in it and pulled off the dome. Talk about a purple beam. Long story short, put the original emitter back in and I am back to where I started. Oh well. Modding 101. Thank you DBC and Teacher for using my XHP70.2 dedome thread as a reference! I ordered an SP33 and soon I will try XHP50.2 too. That was a great read, thanks Jason. It’s probably the same scenario with the 18650’s then as I tested my protected KP 18650 vs the 30Q and the 30Q was substantially better. KeepPower uses a lot of different 18650 models to rewrap with their protection circuitry, so you have to know what cell is under the wrapper. Concerning older and newer chemistries, the same thing does apply to 18650’s as well. The Panasonic NCR18650B 3400 mah (aka Panny B) came out in 2012. It can not compare to a newer cell like the Samsung 35E. The test below is a protected Panny B (not a KeepPower version). This is only at 3A! Huge voltage sag. Ok definitely time for me to upgrade from my panny bs! Quick question Jason tho… how are the “5500mAh” Sofirn cells that are included in the kit on amazon? I have a bunch that I just use as backups. Just ordered some of the black Shocklis from Richard and plan on buying more unless there are even better cells I should be considering?? A couple people have tried the Sofirn 26650. Their 5500mah model seems to measure closer to 5200mah and their 5000mah seems to measure closer to 4700mah. 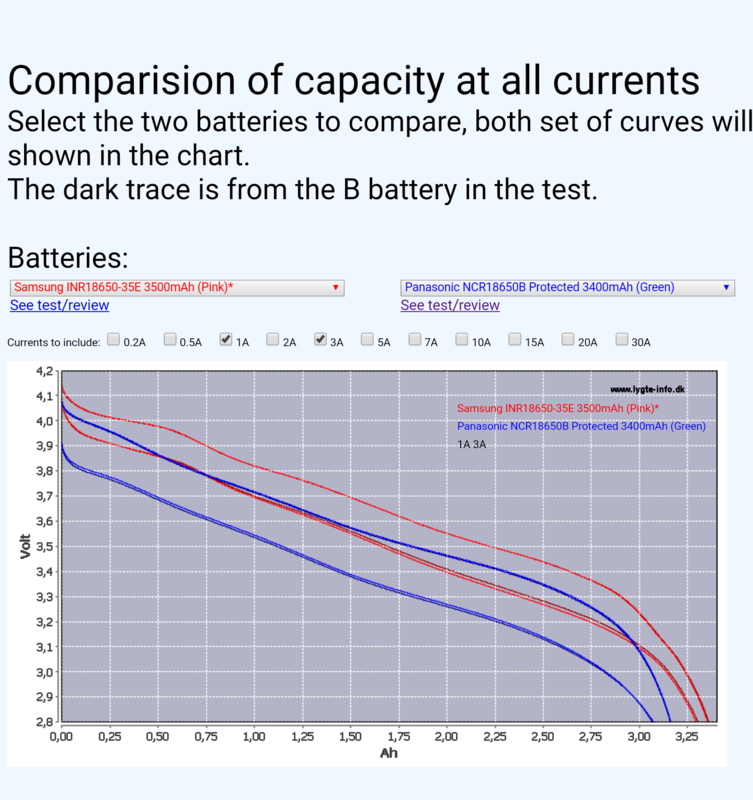 This was measured on typical battery chargers that measure capacity so not super exact. It seems like the more current reviews show the capacity closer to spec. Their internal resistance is a bit high. They are not high drain cells and don’t produce high output in FET driven lights. Since the SP33 seems to have a set voltage that determines when it looses Turbo mode and not a set current limit, I’d say their 26650 cells should be fine to use in the SP33. I wish we had some better reviews of their batteries. I was told by Sofirn that their 5000 and 5500 are basically the same cell, but some gave higher capacity and are labeled 5500mah, while the lower ones are labeled 5000mah. The Shockli 5500 is a superior battery. A real 5750 or so mah and good at delivering high amps. I think it came out in either 2017 or 2018 so it’s quite a modern cell. I use it in my SP33 and get longer battery life than any of my other 4300-5000mah cells.